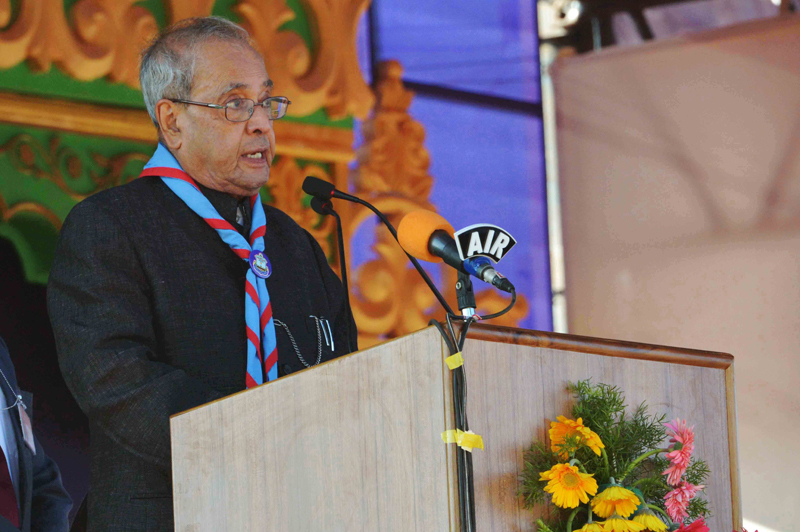 I am indeed happy to be present amidst you on the occasion of the 17thNational Jamboree of Bharat Scouts and Guides at Mysuru, a heritage city of India and the cultural capital of Karnataka. 2. I am informed that the Karnataka State Bharat Scouts and Guides has already hostedtwo National Jamborees atBengaluru in the years 1960 and 1986 and is now hosting the present 17thNational Jamboree at Mysuru. 3. Jamborees are occasions when any organisation reaffirms, redeems and reorients, and I am sure that theactivities in the Jamboree will help Scouts, Guides, Rovers and Rangers and other Volunteers to develop leadership qualities, co-operative spirit and moral values. I am also sure that it will provide a good opportunity to its participants toexchange ideas and exhibit their skills and talents, and help create awareness amongst the youth about the values of national integration, service, discipline, patriotism and peaceful co-existence. 4. India is a land of ancient civilization but young people. By 2020 India will be the youngest country. It’s an asset only if they are skilled and oriented towards the service of the nation. 5. While Scouting was making rapid progress overseas, in India too a move was initiated by Dr. Annie Besant, Dr. G.S. Arundale and other leaders, who foresaw the need of Scouting for the benefit of Indian boys as well. The Scouting Movement had the blessings of great luminaries like Mahatma Gandhi, Dr. Rajendra Prasad,andPandit Jawaharlal Nehru. Subsequently, the movement has been patronized by successive Presidents and Prime Ministers of India and Chief Ministers of States. I am informed that the Boy Scouts Associations in India and the Hindustan Scout Association were merged together on 7thNovember, 1950 and later the Girl Guide Association in India also joined the main stream. 6. The support and patronage of the Royal Family oferstwhile MysuruState and other princely States of our country saw tremendous growth of the movement. Successive State Governments also extended their support and are responsible for the successful existence and growth of the Movement today. 7. I am happy to know that the Scouts and Guide Movement in India has been growing steadily from year to year and has a strength of over 5 Million Scouts and Guides today, and I am sure that this International Youth Movement will enableschool going children become better citizens of our great country.The Scouts and Guide Movement has stood the test of time and is relevant to this day even after 109 years of its existence. Today, there are over 50 million Scouts and Guides throughout the world in 216 countries and territories right from the impressionable age of 3 upto 25 years.